The Zenith atomizer is a collaboration between Phil Busardo, Dimitris Agrafiotis, and Innokin. The goal was to create an easy to use mouth to lung (MTL) replaceable coil-head atomizer. 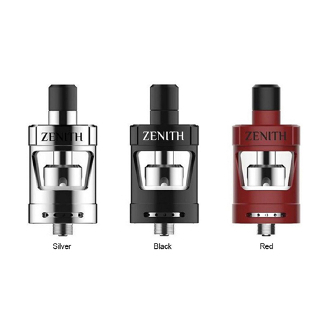 The Zenith is available in both 4ml and 2ml TPD compliant versions. The Zenith features an easy top fill twist design that will automatically shut off the liquid flow when filling in order to prevent flooding and gurgling, an adjustable airflow, and an easy and clean method to replace the coil. One 1.6 Ohm Kanthal coil for a cooler vape at lower wattages. One .8 Ohm Kanthal coil for a slightly warmer vape and slightly higher wattages. cleaning, replacing the coil, and working with the tank in general. The tank is designed for the beginning and experienced vapor alike looking for a quality MTL experience in an affordable package. We truly hope you enjoy the Zenith atomizer!